In our ongoing Inside Track series of interviews with mix engineers, two or three names of plug‑in manufacturers come up with striking regularity. McDSP are perhaps second only to Waves in these professional circles, and the company recently celebrated their 10th birthday, no mean feat in such a competitive market. Like Waves, McDSP plug‑ins are sold primarily in themed bundles, such as the Classic Pack, Project Studio bundle, the newly announced Retro Pack and the all‑encompassing Emerald Pack, which includes all the McDSP plug‑ins there are. The Emerald Pack swelled in 2008 with the addition of the two plug‑ins under review here — the DE555 de‑esser and the FutzBox distortion and speaker simulator — plus the NF575 Noise Filter. All three are also available independently as downloads from the McDSP web site, but only in TDM format for Pro Tools HD systems. 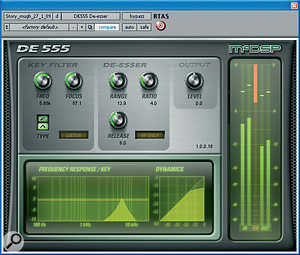 Native RTAS versions are available but only as part of the Emerald Pack, and other native formats such as VST and AU are not supported. The science of de‑essing in software received a major kick up the jacksy last year, thanks to Eiosis's E2 De‑esser (April 2008: /sos/apr08/articles/e2deesser.htm) and Sonnox's Oxford SuprEsser (September 2008: /sos/sep08/articles/supresser.htm). 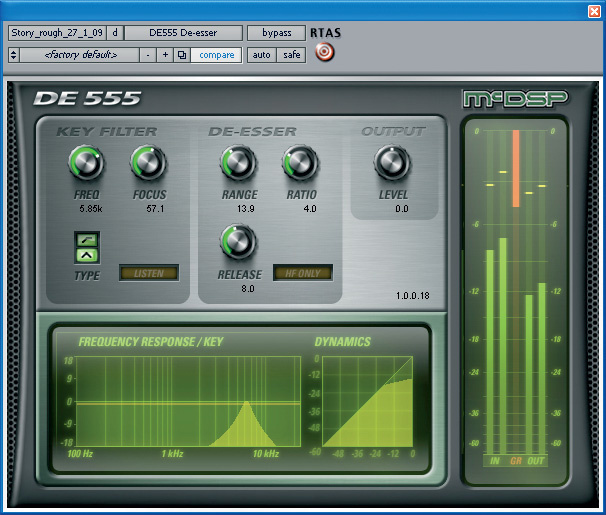 McDSP's offering is closer to the traditional design whereby a compressor's side‑chain signal is filtered so that it responds only to sibilants. They do, however, claim one major improvement: detection of sibilants is independent of the level of the incoming signal. This is important, because de‑essing is often most natural if you do it as the first stage of a vocal signal chain, where levels — pre‑compression and fader rides — can be very variable. There is thus no Threshold control in DE555, but in other respects its parameters are familiar. The Key Filter section allows you to choose between high‑pass and band‑pass filter responses, and to tune both the corner frequency and the bandwidth. Gain reduction is controlled through Range, Ratio and Release time parameters, and you can opt to have it applied to the entire bandwidth or justtp those frequencies above the key filter's corner frequency. The Ratio and Range controls operate like those found on a gate, the Range you set being the maximum amount of gain reduction that can be applied. DE555 doesn't offer some of the advanced options available in E2 De‑esser, such as the ability to completely separate sibilants from non‑sibilants for fully independent processing. Within the constraints of the traditional de‑esser design, though, it does a good job. The lack of anything corresponding to a Threshold parameter means that the only control over the sensitivity of the sibilant detection is that achieved by adjusting the key filter response, and this isn't always sufficient to stop DE555 detecting 'false positives'. Although it is disconcerting to see gain‑reduction triggered by non‑sibilants, in practice this was more of a problem for the eyes than the ears. Because of the level‑independent detection, you can typically achieve effective de‑essing with lower Ratio and Range settings than might be needed in a traditional de‑esser, and the quality is generally very good — certainly better than older designs such as Waves' Renaissance De‑esser. It's also very easy to set up. I'd be more than happy to use it in a mix, especially where results were needed fast, and with careful adjustment of the frequency dial, I was even able to achieve some worthwhile results in a mastering context. However, in problem cases, or where radical processing is required, I'd still look to the more comprehensive control available in E2 De‑esser. A specialised de‑esser is undoubtedly a welcome addition to the Emerald Pack, and helps bolster its claims to be a truly complete suite. However, I have to say that at the current price, DE555 doesn't make such an appealing stand‑alone purchase, given that both E2 De-esser and Oxford SuprEsser are substantially cheaper. Instead, FutzBox is pretty much a direct rival to Audio Ease's Speakerphone plug‑in, reviewed in SOS April 2008 (/sos/apr08/articles/speakerphone.htm). More specifically, it models the distortion and non‑linearity of a wide variety of real‑world playback systems, from car radios to baby monitors. The main conceptual difference between the two is that whereas Speakerphone is based around convolution technology, FutzBox uses what McDSP call "synthetic impulse responses” or SIMs. The idea, it seems, is to offer levels of realism comparable to convolution, yet without the CPU overhead, inflexibility and latency that that technique can bring. The SIMs themselves are perhaps the most important element in shaping the sound, but they're far from alone. Working alongside them are high- and low‑pass filters, a band of parametric EQ, distortion and bit‑crushing modules, a noise generator and a gate. These are brought together in a substantial and largely excellent collection of presets that model everything from subwoofers in neighbouring basements to glass bell-jars. There's only one parameter for the SIM section: a slider labelled Tune. This seems to alter the basic resonant frequencies within the impulse model, rather like changing the formant parameter in a vocal processing plug‑in. So, for example, you can take a SIM that models a fairly large box or speaker, and use the Tune slider to change it to something more like a transistor radio. Most of the other sections are more familiar, such as the EQ and filters, which are derived from McDSP's existing Filterbank plug‑ins. Ten flavours of distortion are available, ranging from relatively subtle saturation to full‑on clipping. The Intensity control, despite the name, adjusts the tone from dark to bright, while the Rectify knob is where much of the most entertaining sonic mayhem is to be found. What's nice is that even extreme settings usually retain the intelligibility of vocals, though all around them may be being pulverised! The noise generator and gate are also worthy of note. There's no direct choice over the 'flavour' of noise, but high- and low‑pass filters are used to tune it to taste, and a built‑in ducker allows you to tuck it away behind the wanted audio where appropriate. The gate, meanwhile, can be used for good, but is also designed for evil, where it does a convincing job of emulating dropouts, static bursts and so forth. If the description above makes it sound as though the obvious applications for FutzBox are mostly in the post‑production domain, that's probably a fair conclusion. Should you need to recreate the sound of somebody else's Walkman, a dodgy transatlantic phone call, a CB radio conversation, or transmissions from a space probe, you've certainly come to the right place. However, that's not to say it doesn't have uses in music, too. For my money, most of the vocal and instrumental treatments are best thought of as special effects and 'ear candy' — you're unlikely to find a signature vocal or guitar sound for an entire album here. There's plenty of potential for creative abuse with drum loops, especially where you need to make them fit within a busy mix; the distortion, noise generator and gate co-operate in some very natural and interesting ways when pushed. 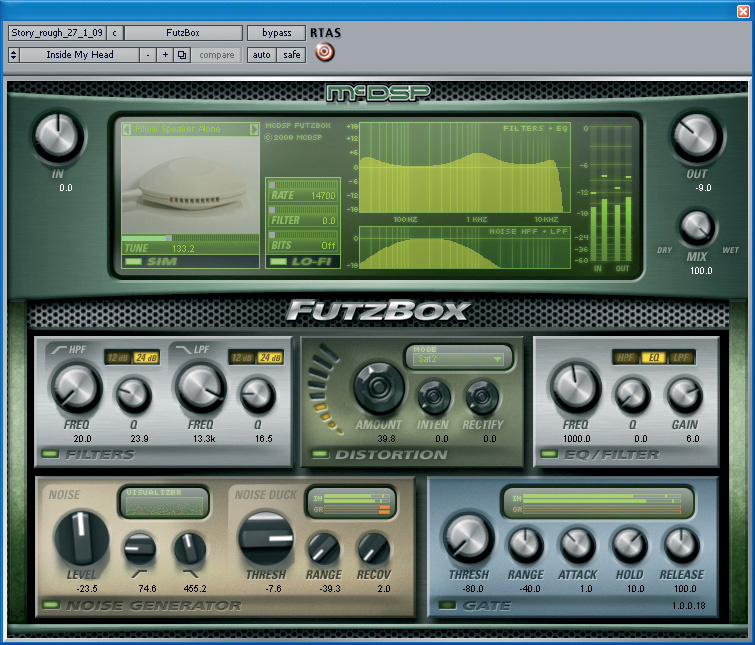 There are, too, situations in which you could apply FutzBox over the entire mix, to give a section of your song some retro or lo‑fi character. The small speaker emulations might even be useful for checking how your mixes will translate to consumer playback systems. A direct comparison with Speakerphone suggests that although Futzbox is impressive, its SIM technology can't always match the sense of realism true convolution can deliver. There are Speakerphone features that are missing here, too, like the compressor, modulation and turntable effects, built‑in convolution reverb, and the ability to play back ambiences and backgrounds, while Speakerphone also offers a wider range of impulses than are encapsulated in FutzBox's SIMs. 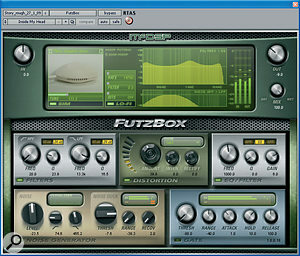 However, although the editing options for the SIM element are no more flexible than you'd find in a typical convolution processor, McDSP's choice of technology certainly pays off in the sense that there's no obvious latency — you can play guitar through FutzBox and hear the results in real time, for instance — and, though its burden on the system is not insignificant, it's lighter on CPU cycles than convolution. And unlike Speakerphone, FutzBox doesn't take 20 minutes to install, or require five gigabytes of disk space. All in all, this is a nice plug‑in which, like other McDSP designs, seems slick and mature even in its first version. It's compact enough to be easy to get to grips with, yet versatile enough to be useful in a wide variety of contexts, and it mostly sounds terrible. In a good way, that is! DE555 is simple to set up, yet very effective. FutzBox offers convincing simulations of a huge range of 'real world' playback systems, without the inconveniences of convolution processing. As a stand‑alone product, DE555 is expensive. True convolution still has a slight edge over modelling in terms of realism. McDSP's Emerald Pack continues to grow, with the addition of two very different processors that do their respective jobs very well. Individual plug‑ins £247.25 (native) or £396.75 (HD); Emerald Pack £1321.55 (native) or £2448.35 (HD). Prices include VAT. Individual HD‑format plug‑ins $495; Emerald Pack $2995 (HD) or $1595 (native). McDSP +1 650 320 8452.